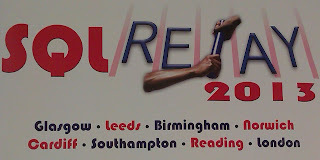 I attended and helped at the SQL Server Relay event in Reading. 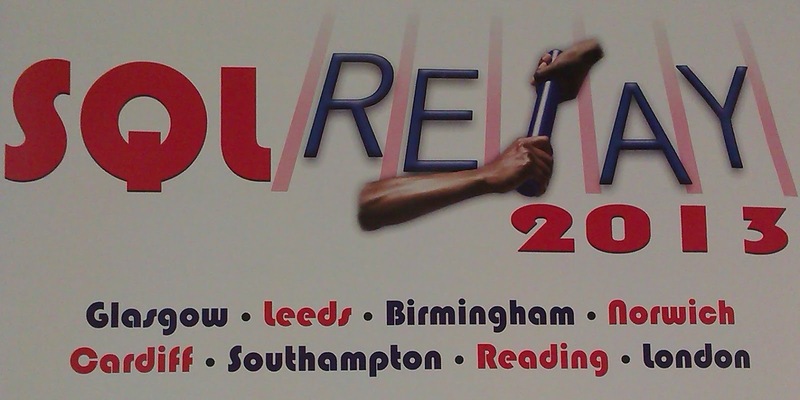 It is an event run by community members who have a passion for SQL Server. The day was full of great techincal sessions. The Keynote SQL Server 2014 and the Data Platform was delivered by Anthony Saxby. SQL Server 2014 features were shared with technology that will help transform the data centre, unlock insight on data , enable people centric IT and increase mission critical performance. The In Memory feature can give performance gains, on average 10 times faster, without having to rewrite code. SQL Server 2014 is for the OLTP workload to compliment SQL Server 2012 and the BI workload enhancements. Many other features were discussed including the platform for hybrid cloud. Hadoop, Big Data and SQL Server session delivered by Justin Langford discussed Hadoop, Horton Works and HD Insight and the paradigm shift of data being stored and then the structure being overlaid later. The session covered the characteristics of data and a comparison of the traditional database warehouse and map reduce. Chris Webb shared the Microsoft BI strategy, What’s New for BI in Excel 2013. The tools that are now available in Excel 2013 covered PowerPivot (part of the UI now), Power View (for creating dashboards), GeoFlow (3D Maps) and Data Explorer at public CTP. You need the Professional Plus edition license for these functions. SQL Server Troubleshooting and Diagnostics by Neil Hambley shared a troubleshooting methodology using the SQLCAT flowchart “Troubleshooting SQL Server 2005/2008 Query Performance/Scalability Issues.” http://sqlcat.com/files/folders/280/download.aspx. The flowchart provides a structure to work with for troubleshooting performance issues which can be customised to each environment. The Era of the Cloud OS is all about transforming the Data Centre. The transformation trends of cloud computing, new social media, consumerization of IT and data explosion have brought the need for building blocks and multi tenanted architectures. Automation with PowerShell, commodity hardware and virtualization are all tools linking with the cloud. Most SQL Server workloads can now be supported on virtualization with only a 6% overhead. A great session was shared on getting the most from your SAN – file and file group design patterns. Stephen Archibold gave some useful references on articles to read to gain further insight. The last session of the day was on Parallel Data Warehouse by Ryan Simpson which shared details about the massively parallel processing platform. The appliance is Data Warehousing best practices in a box. The disk layout and scale out designs were shared. Announcements were made today at TechEd North America about SQL Server 2014 and Azure. The next Microsoft data platform is SQL Server 2014 which is for the enterprise cloud era and the role of data. This will be available in preview later this month. Microsoft are looking at the role of data and how it integrates with the business. As a result they are evolving analytics techniques for Real-time data integration and adding more fluid visualizations . Read about more the announcement details http://msft.it/6037kZqh and their summary image denotes the evolution of SQL Server. These are all enhancements to the other recent new data platform features codename 'Data Explorer', HDInsight, Polybase in Parallel Data Warehouse and codename 'Geoflow'.